Christmas is SO CLOSE I CAN HARDLY STAND IT! My family is coming to Denver very soon, our gifts are wrapped and under the tree, and I the only thing I'm panicking about is the fact that there is no snow on the ground. I guess I can't control that though, can I? All in all, I'm feeling very Christmasy and warm and fuzzy and all that. On of the most exciting parts of the season this year has been watching Riley's face every time he talks about presents, Santa, baby Jesus, Frosty the Snowman, and Rudolph the Red Nosed Reindeer. Experiencing joy like that through a 2 year old's eyes is something I can't begin to explain. It's magical. I've been trying to develop traditions for our family that we can do every year from what kind of cookies we make to the classic Christmas movies and music we play. 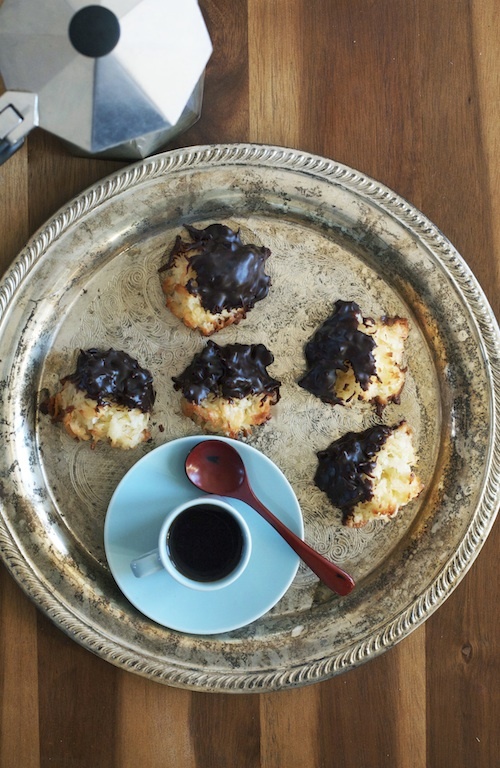 These coconut macaroons dipped in chocolate have quickly become a family favorite. Even my husband, who doesn't like coconut, went crazy over these tasty little cookies. 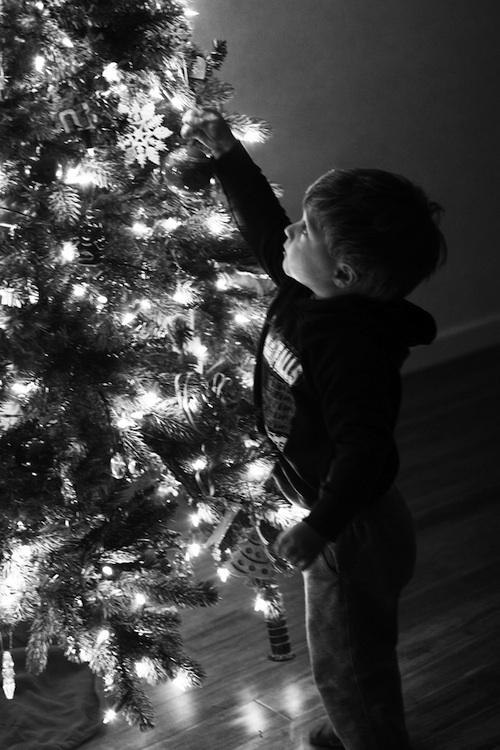 What are your favorite holiday traditions? 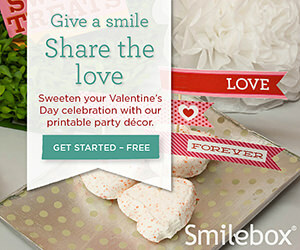 Do you make cookies with your family? Do you go look at lights in your neighborhood? I'd love to hear what makes your season magical! Place a cooling rack over a baking sheet and set aside. In a large bowl, whisk the eggs, sugar, salt and vanilla together until combined. Use a spatula to fold the coconut into the egg mixture. Use a teaspoon to scoop mounts of batter onto the prepared baking sheet. Bake the macaroons for about 20 minutes or until the coconut has turned golden brown and the edges become slightly crispy. Cool the macaroons on a cooling rack before dipping them in the chocolate. 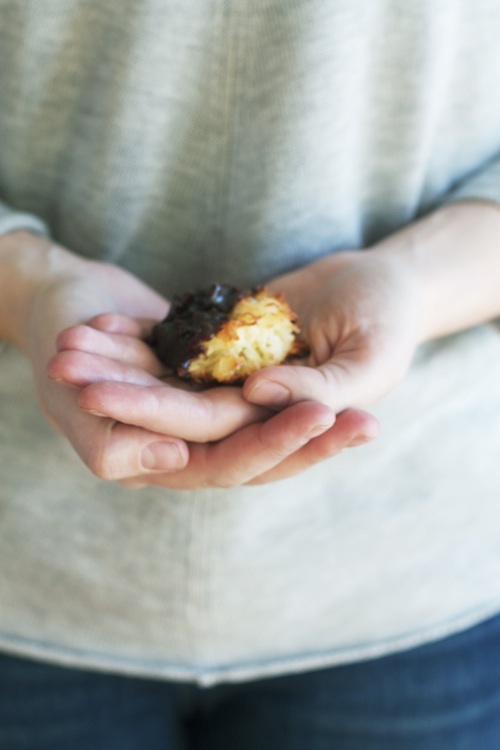 While the macaroons cook, combine the chocolate, heavy cream and butter in a medium, microwave safe bowl. Microwave for 30 second intervals, stirring after each interval, until the chocolate is melted. Dip the cooled macaroons in the chocolate and place on the cooling rack that has been set over the baking sheet. Allow the chocolate to set for about 2 hours before transferring to a platter.